Donna Summer & Paul Jabara - Joe.My.God. 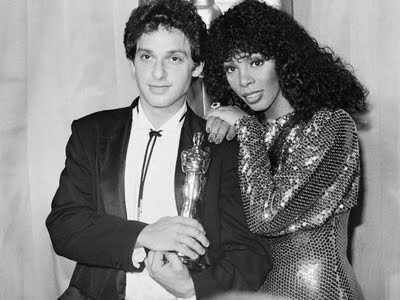 We cannot properly memorialize Donna Summer without mentioning Paul Jabara, the late gay songwriter and performer who won the Academy Award for Best Original Song after his Last Dance was performed by Summer in the pitiful disco movie, Thank God It’s Friday. Jabara had a bit part in the film and his own track, Trapped In The Stairway, was included on the terrific soundtrack. Jabara also wrote No More Tears for Summer and Barbra Streisand, but his greatest fame, perhaps, is for co-writing It’s Raining Men with Letterman sidekick Paul Shaffer. As so many of our most creative did, Paul Jabara succumbed to AIDS in the early 90s. Below is his amusing 1977 duet with Donna, Shut Out/Heaven Is A Disco. “To get off my bummer, I play Donna Summer!” Donna’s spoken impression of Tina Turner is worth waiting for. The questions are easy…the answers are RUFF. And here’s Donna’s Thank God It’s Friday turn as aspiring disco singer Nicole Sims, in a bit that also pokes fun at her first hit. Trivia: Jeff Goldblum plays the owner of the disco. And watch out for Debra Winger with a tissue.